I am alllllll over the rustic come industrial mix of this wedding. It is completely charming, relaxed and ruddy gorgeous. 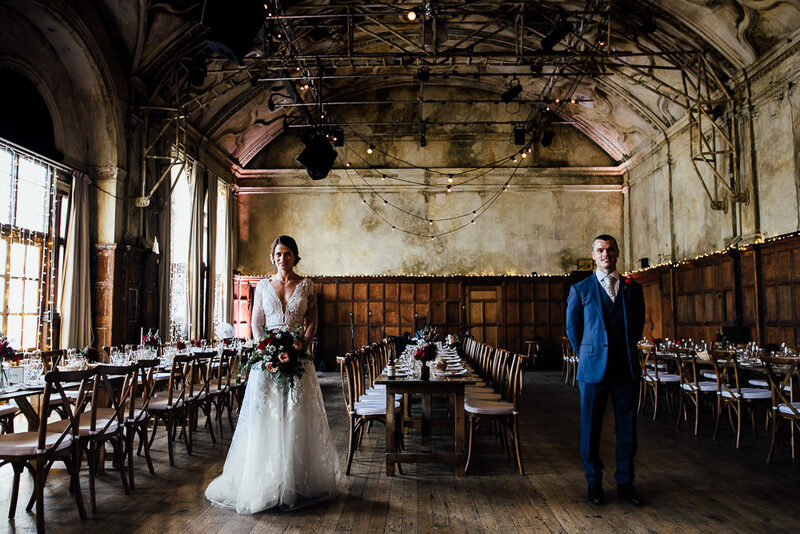 Battersea Arts Centre was made for weddings like this. Apparently, Maria & Phil played a hilarious film of themselves playing Clueless and Top Gun whilst their guests ate popcorn and held a surprise impromptu ceremony afterwards. This is just amazing! 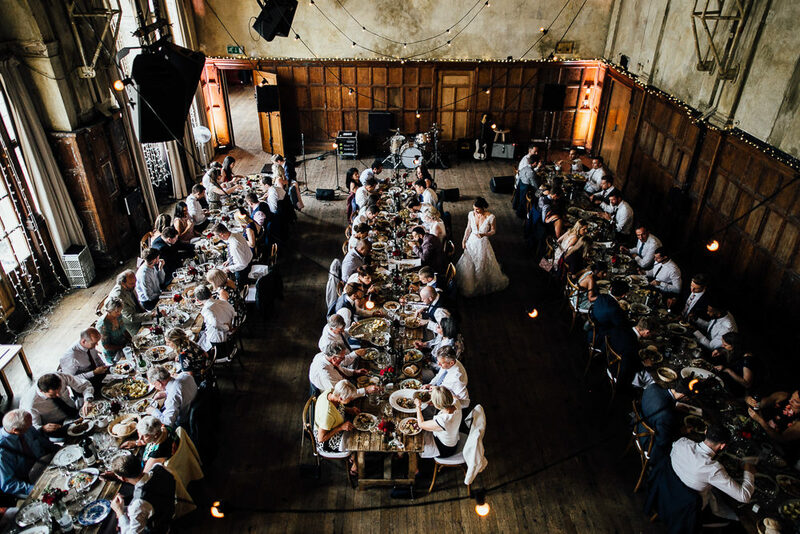 Rustic wedding in the City at Battersea Arts Centre, London. Photography by Beatrici Photography. 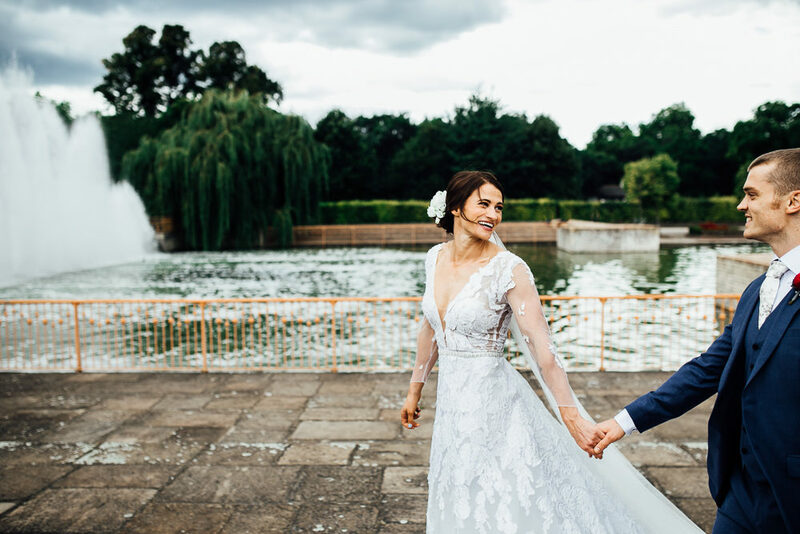 Bride wears Brasilia dress by Cymbeline. 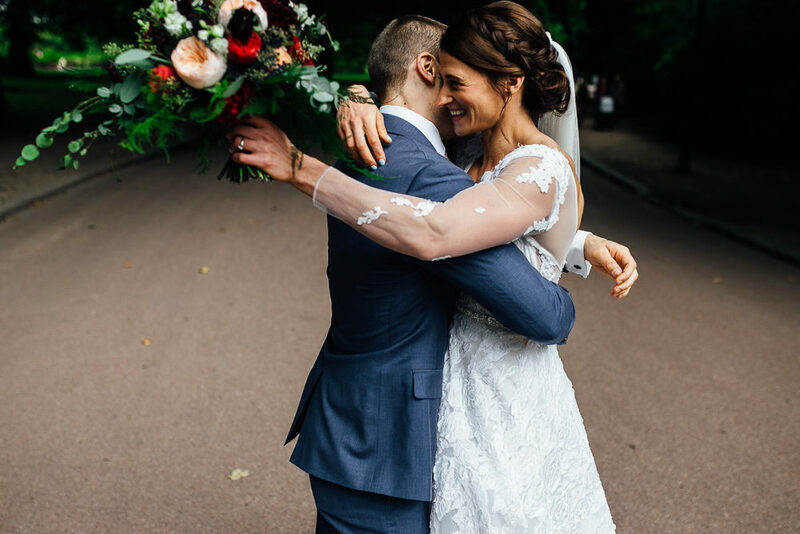 Maria the Bride: I’m not a big fan of dress shopping and, given my body shape, I assumed it would be very difficult to find something I liked (and could afford!). I was very lucky to find the perfect dress and accessories at Morgan Davies in Hitchin, the Brasilia dress by Cymbeline. 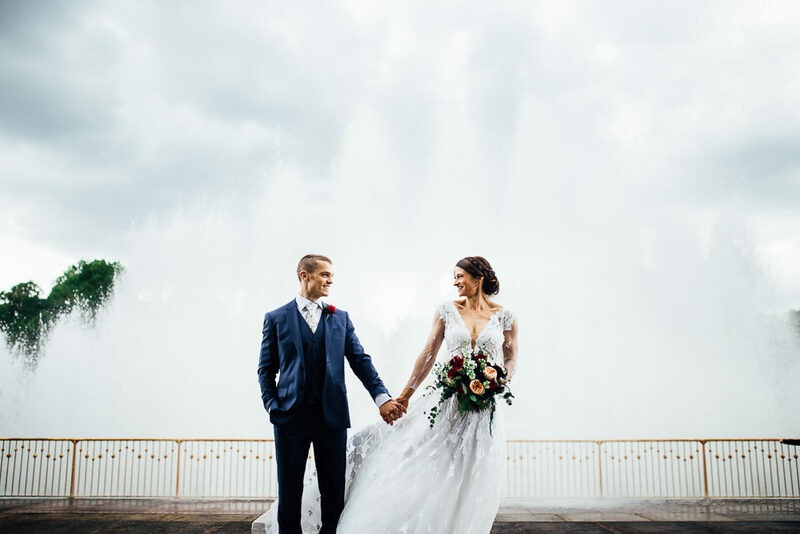 It was completely not what I thought I would want – I had images of a sleeveless, mermaid-style dress and walked out with a long sleeve, plunging neckline A-line dress – but it suited my personality and the style of the wedding perfectly. I was also very lucky to find an amazing seamstress, Sam D’Cruze, in Hitchin who spent hours altering the dress to fit my body perfectly. 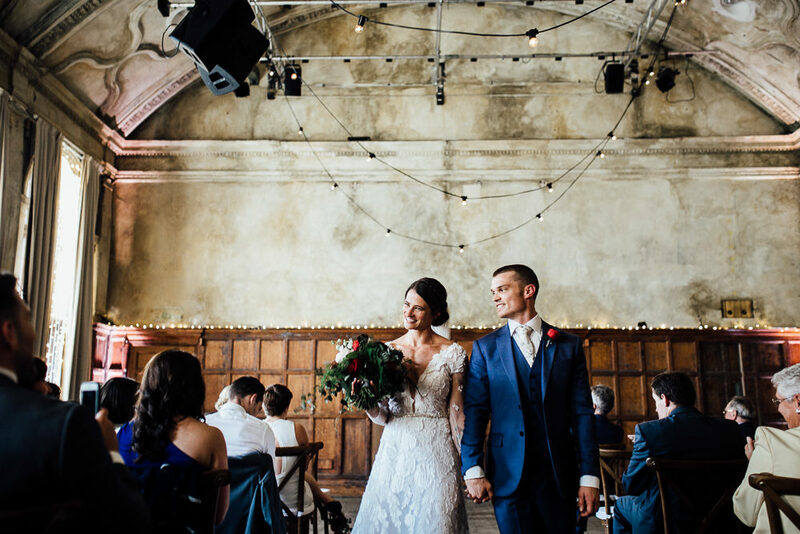 We knew from the beginning that we wanted our wedding to have a relaxed, fun vibe, from the movie we showed before the ceremony, to the hog roast we had for dinner, to the band we had playing in the evening. We also knew that we had to have a wedding in London. We looked at a few venues and they all seemed too empty-warehouse-trendy, or too formal and just all around not us. Then we saw Battersea Arts Centre, and it was perfect. Tanith Lindon, Jessica Reid, and the staff there were so helpful, accommodating, and, after previous meetings with a few event staff from other venues that seemed less than enthusiastic about weddings, we felt that they genuinely wanted our day to be everything that we wanted it to be. The building is amazing and the space where we had our wedding was the perfect combination of grandiose without being overstated, and vintage without being gimmicky. Our first date was in a blues bar in Stockholm and we were engaged on a road trip in Colorado (where we visited our fair share of breweries! ), so we decided to go with the theme “Blues, Brews, and I Do’s” for our wedding. With our colour scheme and decor, we wanted to combine the rustic outdoor-sy feel of the places we visited in Colorado with the chilled vibe we remembered from the blues bar we went on our first date. For our colour palette, we went with earthy colours, accented with gold and deep red. We hired wooden trestle tables and wine barrels from Classic Crockery to use as cocktail tables for our bar area. For table runners, we went to a few of our favourite coffee roasters and asked for old coffee bean bags – they had loads! I stitched these into table runners to use in the main space. It was a DIY task I am glad I will never have to do again! We had also collected some beer growlers during our travels to different breweries which our florist, Daisy Ellen, filled with beautiful arrangements of wildflowers to put on each wine barrel in the bar area. Daisy Ellen did an amazing job with our flowers. The single bud arrangements she did for our tables were perfect. I also wanted to do something a bit different from the traditional bridesmaid’s bouquets (they can be quite cumbersome to carry around all day!) and requested corsages. She made the most gorgeous corsages on golden bangles that the bridesmaids could wear all night. We are very fortunate to have a ton of talented friends. One of our friends, Conor Ryan, happens to be a very talented film producer, so we enlisted him not just to film our wedding, but to also create movie previews that we could play while people were waiting for the ceremony to begin. These were spoof previews of famous movie trailers featuring the bridal party. We did Clueless (with the bridesmaids), Top Gun (with the groomsmen) and even the shower scene from Psycho (the bride got to play Norman Bates!) It got everyone laughing, our guests loved it and it was a great way to introduce the relaxed vibe of the evening. 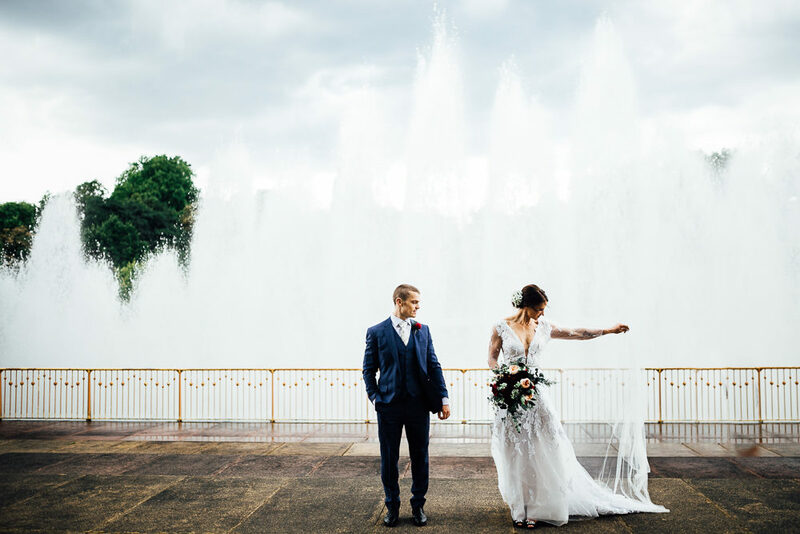 Since we had already been married at Town Hall a few months earlier, our wedding was more of a celebration than an official ceremony and we were able to write the ceremony script ourselves. We had our good friend Gareth as the officiant and, in our vows, I even promised to get Phil a puppy! Long before we were engaged, we went to the Blues Kitchen in Shoreditch for Phil’s birthday where we first saw the Atlantic Soul Orchestra. We made the decision that night that we had to have them at our wedding. I think we actually booked them before we booked our venue! 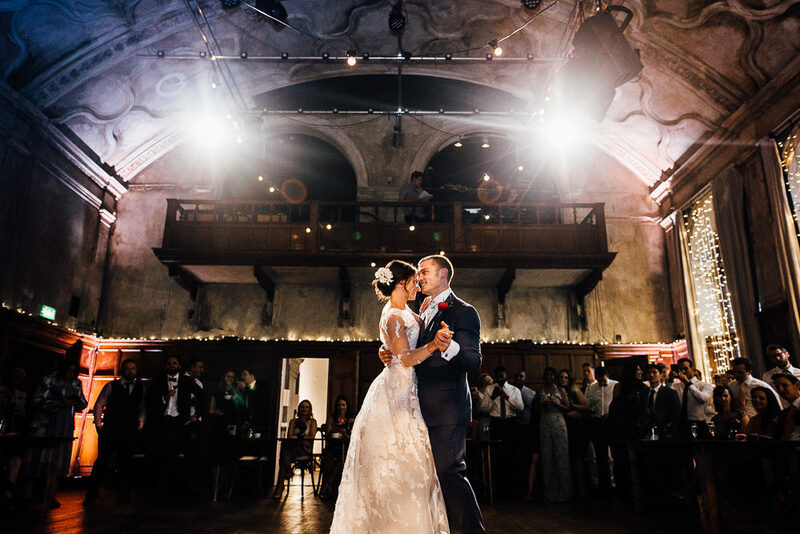 ASO was definitely our splurge, but we decided that the most important thing about our wedding was the music, and it was well worth it. They played an amazing show and got everyone dancing. Phil didn’t have many requests for the wedding (he didn’t really mind what the invites looked like or what the colour scheme would be), but he did know that he absolutely must have a hog roast, craft beer and cheesecake for our wedding cake. 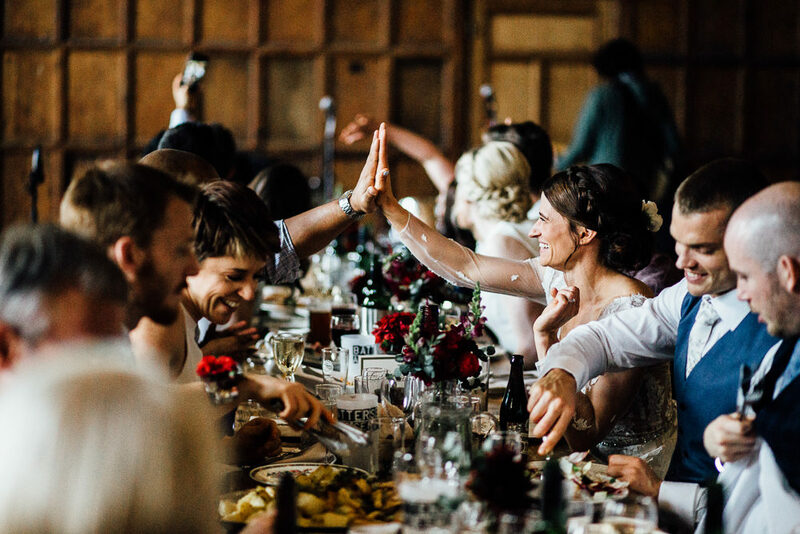 Luckily for us, Battersea Arts Centre was completely on board with these requests and their chef and bar manager put together an amazing menu of roast and pulled pork, crackling, and sauces, accompanied by super tasty beers from local breweries, Mondo Brewing Company and Signature Brew. They even accommodated my very American request of having “Brinner” (Breakfast for Dinner) as evening snacks! We had sausages, pancakes with maple syrup and fruit kebabs to keep our guests fuelled and dancing all night. 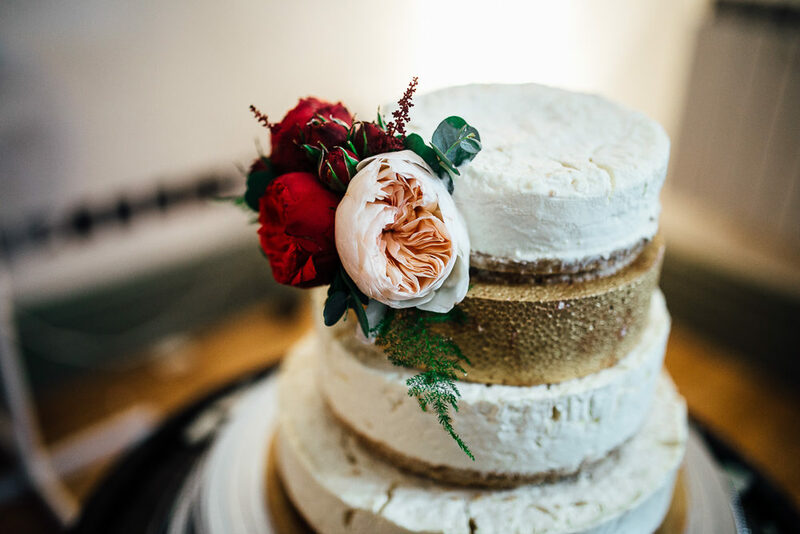 Our good friend Gwyneth Barrett from Sweet Cake Bites undertook the challenging task of making a tiered cheesecake. It was everything we hoped for! I felt the wedding photographer was the hardest thing to decide on. I looked at website after website and, to be honest, they all started to look the same! That was until we came across Alline’s site! 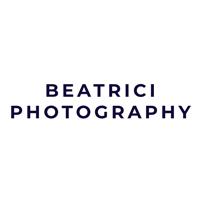 Beatrici Photography We immediately fell in love with her work. Phil said that instead of just taking photos, she seemed to capture stories. The way she photographs not just people, but their reactions to special moments, is priceless. After meeting her, we also loved that she would fit in perfectly with our other wedding guests. She made friends with our friends which made for amazing photos of truly memorable experiences. Stunning Brasilia dress by Cymbeline. Stunning Wedding Table Settings. Table names.